What’s behind Thailand’s projected economic upturn in 2018? 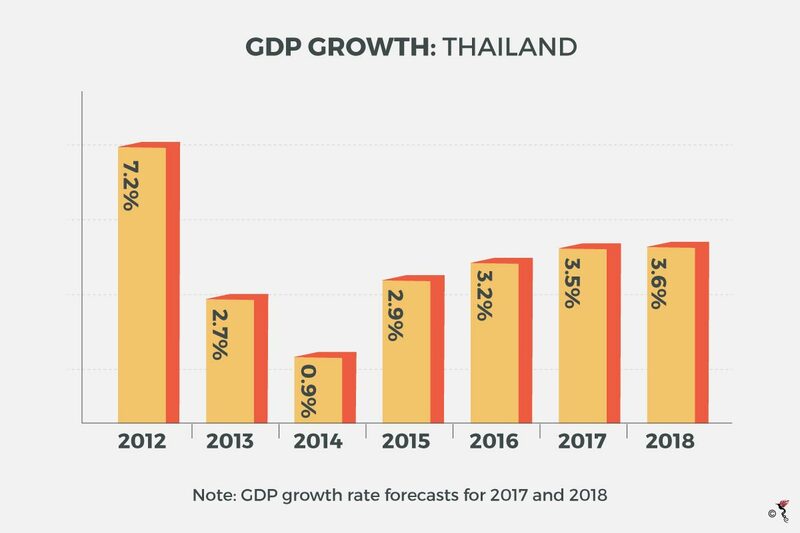 While Thailand’s economy has not been rosy for the past few years, its economic outlook seems brighter in 2018. According to a Bloomberg report, the predicted economic boom will be the product of a “global trade recovery and a flood of visitors from China.” Apart from that, the end of King Bhumibol’s mourning period will also fortify consumer spending, as retailers and hotels had scaled down promotions during the entire year. The government is also ramping up infrastructure spending on projects such as the "Smart City" concept in the Eastern Economic Corridor (EEC) which development is slated to begin this year. Based on estimates in the last quarter of 2017 and into the beginning of 2018, a general upturn is forecasted throughout the year. For example, a report by the Thailand Development Research Institute (TRDI) states that the “Thai economy this year is poised to grow close to 4%, the highest rate since 2012.” The central bank has forecasted that the Thai economy will expand by 3.9 percent in 2018, up from its previous estimate of 3.8 percent growth. The Asian Development Bank (ADB) has projected a rise up to 3.8% from the contribution of growth in a few sectors, specifically tourism and exports. Indexes such as the gross domestic product (GDP) growth and inflation rate have also implied that the economy is going strong. Due to a recent lag in the farming sector, Thailand’s growth for this year is focussed in the sectors that are related to exports and tourism. Growth of the Thai economy in 2017 has been hugely contributed by the revival in exports, which will extend into this year, reports TRDI. Thailand’s export markets are experiencing a positive growth because of economic recoveries in respective countries such as the United States. Export growth to all other major markets, namely the European Union, China, Japan and the ASEAN, has been sturdy as well. The newly-industrialised Thai economy is one that is heavily reliant on exports, specifically exports on computers, delivery trucks, rice and textiles which makes up more than two-thirds of Thailand’s GDP. Likewise, reports from TRDI have stated that a tourism boom will profoundly impact the growth of the economy as well. With the end of the year-long mourning period for King Bhumibol, Thailand will once again be an attractive destination for holidaymakers in the region and outside of Asia. Recent infrastructural developments of tourist destinations such as Koh Samui and Phuket also would encourage tourists further to visit these places. The World Travel and Tourism Council also projects that Thailand’s tourism industry will see an average annual growth rate of 6.7 percent over the next decade due to these developments. Apart from exports and tourism, the Thai government has also introduced several tender opportunities to further contribute to the country’s infrastructure. Example of projects that are up for bidding include an inter-city rail network system, enhancements to the highway network to link with the key areas across the nation, as well as air transport and maritime development. These strategies will further enhance the appeal of the country with incentives such as lower transport costs and easier access to the respective cities. This will help continue to boost the economy over the current year and the following years ahead. With the expected booms in the above-mentioned sectors, Thailand’s GDP will definitely come close to last year’s 4%. However, the country still has room to maximise this growth through smaller scale approaches such as the strengthening of linkages of local supply chains with exports and tourism, or raising access to markets and reducing costs of both farm and non-farm businesses through better technologies. The government should also consider investments in education, skills training for employees as we transition into the Fourth Industrial Revolution. “Only when growth is sustainable and inclusive can Thailand and its people prosper in the future,” Kirida added.